For specific types of conservation, see Conservation (disambiguation). "Conservationism" redirects here. It is not to be confused with Conservatism. Much attention has been given to preserving the natural characteristics of scenic features such as Hopetoun Falls, Australia, while allowing ample access for visitors. The early conservation movement included fisheries and wildlife management, water, soil conservation, and sustainable forestry. The contemporary conservation movement has broadened from the early movement's emphasis on use of sustainable yield of natural resources and preservation of wilderness areas to include preservation of biodiversity. Some say the conservation movement is part of the broader and more far-reaching environmental movement, while others argue that they differ both in ideology and practice. Chiefly in the United States, conservation is seen as differing from environmentalism in that it aims to preserve natural resources expressly for their continued sustainable use by humans. Outside the U.S. the term conservation more broadly includes environmentalism. The conservation movement can be traced back to John Evelyn's work Sylva, presented as a paper to the Royal Society in 1662. Published as a book two years later, it was one of the most highly influential texts on forestry ever published. Timber resources in England were becoming dangerously depleted at the time, and Evelyn advocated the importance of conserving the forests by managing the rate of depletion and ensuring that the cut down trees get replenished. The field developed during the 18th century, especially in Prussia and France where scientific forestry methods were developed. These methods were first applied rigorously in British India from the early-19th century. The government was interested in the use of forest produce and began managing the forests with measures to reduce the risk of wildfire in order to protect the "household" of nature, as it was then termed. This early ecological idea was in order to preserve the growth of delicate teak trees, which was an important resource for the Royal Navy. Concerns over teak depletion were raised as early as 1799 and 1805 when the Navy was undergoing a massive expansion during the Napoleonic Wars; this pressure led to the first formal conservation Act, which prohibited the felling of small teak trees. The first forestry officer was appointed in 1806 to regulate and preserve the trees necessary for shipbuilding. This promising start received a setback in the 1820s and 30s, when laissez-faire economics and complaints from private landowners brought these early conservation attempts to an end. Conservation was revived in the mid-19th century, with the first practical application of scientific conservation principles to the forests of India. The conservation ethic that began to evolve included three core principles: that human activity damaged the environment, that there was a civic duty to maintain the environment for future generations, and that scientific, empirically based methods should be applied to ensure this duty was carried out. Sir James Ranald Martin was prominent in promoting this ideology, publishing many medico-topographical reports that demonstrated the scale of damage wrought through large-scale deforestation and desiccation, and lobbying extensively for the institutionalization of forest conservation activities in British India through the establishment of Forest Departments. Edward Percy Stebbing warned of desertification of India. The Madras Board of Revenue started local conservation efforts in 1842, headed by Alexander Gibson, a professional botanist who systematically adopted a forest conservation program based on scientific principles. This was the first case of state management of forests in the world. These local attempts gradually received more attention by the British government as the unregulated felling of trees continued unabated. In 1850, the British Association in Edinburgh formed a committee to study forest destruction at the behest of Dr. Hugh Cleghorn a pioneer in the nascent conservation movement. He had become interested in forest conservation in Mysore in 1847 and gave several lectures at the Association on the failure of agriculture in India. These lectures influenced the government under Governor-General Lord Dalhousie to introduce the first permanent and large-scale forest conservation program in the world in 1855, a model that soon spread to other colonies, as well the United States. In the same year, Cleghorn organised the Madras Forest Department and in 1860 the Department banned the use shifting cultivation. Cleghorn's 1861 manual, The forests and gardens of South India, became the definitive work on the subject and was widely used by forest assistants in the subcontinent. In 1861, the Forest Department extended its remit into the Punjab. Sir Dietrich Brandis, a German forester, joined the British service in 1856 as superintendent of the teak forests of Pegu division in eastern Burma. During that time Burma's teak forests were controlled by militant Karen tribals. He introduced the "taungya" system, in which Karen villagers provided labor for clearing, planting and weeding teak plantations. After seven years in Burma, Brandis was appointed Inspector General of Forests in India, a position he served in for 20 years. He formulated new forest legislation and helped establish research and training institutions. The Imperial Forest School at Dehradun was founded by him. Germans were prominent in the forestry administration of British India. As well as Brandis, Berthold Ribbentrop and Sir William P.D. Schlich brought new methods to Indian conservation, the latter becoming the Inspector-General in 1883 after Brandis stepped down. Schlich helped to establish the journal Indian Forester in 1874, and became the founding director of the first forestry school in England at Cooper's Hill in 1885. He authored the five-volume Manual of Forestry (1889–96) on silviculture, forest management, forest protection, and forest utilization, which became the standard and enduring textbook for forestry students. 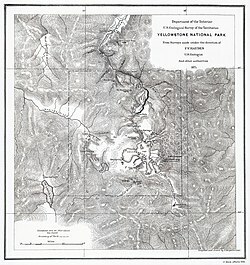 F. V. Hayden's map of Yellowstone National Park, 1871. The American movement received its inspiration from 19th century works that exalted the inherent value of nature, quite apart from human usage. Author Henry David Thoreau (1817-1862) made key philosophical contributions that exalted nature. Thoreau was interested in peoples' relationship with nature and studied this by living close to nature in a simple life. He published his experiences in the book Walden, which argued that people should become intimately close with nature. The ideas of Sir Brandis, Sir William P.D. Schlich and Carl A. Schenck were also very influential - Gifford Pinchot, the first chief of the USDA Forest Service, relied heavily upon Brandis' advice for introducing professional forest management in the U.S. and on how to structure the Forest Service. Both conservationists and preservationists appeared in political debates during the Progressive Era (the 1890s—early 1920s). There were three main positions. The laissez-faire position held that owners of private property—including lumber and mining companies, should be allowed to do anything they wished on their properties. The conservationists, led by future President Theodore Roosevelt and his close ally George Bird Grinnell, were motivated by the wanton waste that was taking place at the hand of market forces, including logging and hunting. This practice resulted in placing a large number of North American game species on the edge of extinction. Roosevelt recognized that the laissez-faire approach of the U.S. Government was too wasteful and inefficient. In any case, they noted, most of the natural resources in the western states were already owned by the federal government. The best course of action, they argued, was a long-term plan devised by national experts to maximize the long-term economic benefits of natural resources. To accomplish the mission, Roosevelt and Grinnell formed the Boone and Crockett Club, whose members were some of the best minds and influential men of the day. Its contingency of conservationists, scientists, politicians, and intellectuals became Roosevelt's closest advisers during his march to preserve wildlife and habitat across North America. Preservationists, led by John Muir (1838–1914), argued that the conservation policies were not strong enough to protect the interest of the natural world because they continued to focus on the natural world as a source of economic production. The debate between conservation and preservation reached its peak in the public debates over the construction of California's Hetch Hetchy dam in Yosemite National Park which supplies the water supply of San Francisco. Muir, leading the Sierra Club, declared that the valley must be preserved for the sake of its beauty: "No holier temple has ever been consecrated by the heart of man." President Roosevelt put conservationist issue high on the national agenda. He worked with all the major figures of the movement, especially his chief advisor on the matter, Gifford Pinchot and was deeply committed to conserving natural resources. He encouraged the Newlands Reclamation Act of 1902 to promote federal construction of dams to irrigate small farms and placed 230 million acres (360,000 mi2 or 930,000 km2) under federal protection. Roosevelt set aside more federal land for national parks and nature preserves than all of his predecessors combined. Roosevelt established the United States Forest Service, signed into law the creation of five national parks, and signed the year 1906 Antiquities Act, under which he proclaimed 18 new national monuments. He also established the first 51 bird reserves, four game preserves, and 150 national forests, including Shoshone National Forest, the nation's first. The area of the United States that he placed under public protection totals approximately 230,000,000 acres (930,000 km2). Gifford Pinchot had been appointed by McKinley as chief of Division of Forestry in the Department of Agriculture. In 1905, his department gained control of the national forest reserves. Pinchot promoted private use (for a fee) under federal supervision. In 1907, Roosevelt designated 16 million acres (65,000 km2) of new national forests just minutes before a deadline. In May 1908, Roosevelt sponsored the Conference of Governors held in the White House, with a focus on natural resources and their most efficient use. Roosevelt delivered the opening address: "Conservation as a National Duty.". In 1903 Roosevelt toured the Yosemite Valley with John Muir, who had a very different view of conservation, and tried to minimize commercial use of water resources and forests. Working through the Sierra Club he founded, Muir succeeded in 1905 in having Congress transfer the Mariposa Grove and Yosemite Valley to the federal government. While Muir wanted nature preserved for its own sake, Roosevelt subscribed to Pinchot's formulation, "to make the forest produce the largest amount of whatever crop or service will be most useful, and keep on producing it for generation after generation of men and trees." Theodore Roosevelt's view on conservationism remained dominant for decades; - Franklin D. Roosevelt authorised the building of many large-scale dams and water projects, as well as the expansion of the National Forest System to buy out sub-marginal farms. In 1937, the Pittman–Robertson Federal Aid in Wildlife Restoration Act was signed into law, providing funding for state agencies to carry out their conservation efforts. Environmental reemerged on the national agenda in 1970, with Republican Richard Nixon playing a major role, especially with his creation of the Environmental Protection Agency. The debates over the public lands and environmental politics played a supporting role in the decline of liberalism and the rise of modern environmentalism. Although Americans consistently rank environmental issues as "important", polling data indicates that in the voting booth voters rank the environmental issues low relative to other political concerns. The growth of the Republican party's political power in the inland West (apart from the Pacific coast) was facilitated by the rise of popular opposition to public lands reform. Successful Democrats in the inland West and Alaska typically take more conservative positions on environmental issues than Democrats from the Coastal states. Conservatives drew on new organizational networks of think tanks, industry groups, and citizen-oriented organizations, and they began to deploy new strategies that affirmed the rights of individuals to their property, protection of extraction rights, to hunt and recreate, and to pursue happiness unencumbered by the federal government at the expense of resource conservation. Although the conservation movement developed in Europe in the 18th century, Costa Rica as a country has been heralded its champion in the current times. Costa Rica hosts an astonishing number of species, given its size, having more animal and plant species than the US and Canada combined while being only 250 miles long and 150 miles wide. A widely accepted theory for the origin of this unusual density of species is the free mixing of species from both North and South America occurring on this "inter-oceanic" and "inter-continental" landscape. Preserving the natural environment of this fragile landscape, therefore, has drawn the attention of many international scholars. 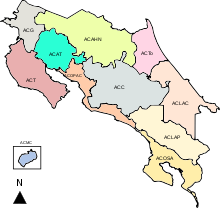 Costa Rica has made conservation a national priority, and has been at the forefront of preserving its natural environment with over a quarter of its land designated as protected in some form, which is under the administrative control of SINAC (National System of Conservation Areas)  a division of MINAE (Ministry of Environment, Energy and Telecommunications). SINAC has subdivided the country into various zones depending on the ecological diversity of that region - these zones are depicted in figure 1. The country has used this ecological diversity to its economic advantage in the form of a thriving ecotourism industry, putting its commitment to nature, on display to visitors from across the globe. It is estimated that a record 2.6 million foreigners visited the country in 2015, almost half the population of Costa Rica itself. This tourism is facilitated by the fact that Costa Rica has a stable democracy and has a human development index of 0.776, the highest for any country in Latin America. It is also the only country in the world that generates more than 99% of its electricity from renewable sources, relying on hydropower (78%), wind (10%), geothermal energy (10%), biomass and solar (1%). Critics have pointed out however, that in achieving this milestone, the country has built several dams (providing the bulk of its electricity) some of which have negatively impacted indigenous communities as well as the local flora and fauna. "The Green Republic: A Conservation History of Costa Rica" by Sterling Evans is a renowned book that traces the development of the conservation movement in Costa Rica from the mid 1700s to present day. Evans mentions that when the Spaniards first arrived in the Americas, the landscape of Costa Rica did not appear particularly hospitable to them, compared to Guatemala or Mexico which seemed more reminiscent of the Spanish climate. Therefore, up until the 18th century, there was very little agricultural development in the region. It also lacked gold and other minerals that Christopher Columbus had hoped to find in these areas (hence the name, Rich Coast). As a result, the forest cover of Costa Rica was left more or less intact by the European settlement in the Americas. By the mid-19th century, it was observed that the Costa Rican soil was particularly conducive to the growth of coffee. The global demand for coffee was growing rapidly, fueled by the demand from the working class in the industrializing west. The agricultural model adopted by coffee growers in Costa Rica was of small family owned farms known as cafeteras, and they strove to be responsible stewards of the land. This approach was in stark contrast to the coffee monoculture that would've developed by adopting a purely capitalistic ideology. As a result, even though the coffee production increased substantially from 1850 to 1950, there wasn't large scale deforestation in Costa Rica until the 1950s, contrary to popular belief. "in the mid-1930s, Costa Rica was still largely unspoiled. Its population of less than a half a million people . . .was concentrated in the narrow Meseta Central. . . . Other advantages . . . to the naturalist were its political stability and the friendliness of its people. . . . Costa Rica has a record of continuous, orderly constitutional government that scarcely any other country in Latin America can match. Thus the naturalist working in some remote spot was not likely to have his studies suddenly interrupted or his thin lines of communication cut by a violent upheaval, as has happened to many in Latin America. ."
3. By 1950, Costa Rica became heavily reliant on coffee exports to Europe and the US. Around the same time, it was battling the dilemma between increasing agricultural output on one hand and protecting natural resources for future use on the other. In 1958, however, the world coffee prices plummeted, and Costa Rica's main source of income was shown to be very vulnerable to unpredictable forces. The government responded by promoting internal manufacturing and encouraging other industries. One such industry that emerged as a result, was the meat industry. The Central American valley has been described as "perfect for cattle" by Carl Hoffman. Until 1970, the cattle raised in Costa Rica were primarily used for domestic consumption. Around 1970, the demand for beef from the US started showing an exponential growth due to the rise of the fast-food industry. This robust demand, coupled with the falling coffee prices gave the cattle industry a boost and forests started getting replaced with pastures. At its worst, Costa Rica was losing 4% of its forested area per year. An alternative analysis by Julia Flagg within the framework of "process-tracing" reveals that after gaining independence in 1821 the isolation of Costa Rica from El Salvador, Honduras, Guatemala, and Nicaragua was critical in shaping its future and served as a divergence point in the evolution of the Central American nations. According to Mahoney  “ . . . while all of the other provinces quickly became engulfed in warfare and political chaos, Costa Rica escaped such devastation and made tentative economic strides forward”. She also argues that the lack of a land-owning elite class in Costa Rica was instrumental in the development of good governance and maintaining a stable democracy in the country. The abolishing of the military in 1948 helped free up valuable resources that the government chose to invest into education and resource protection. The country entered into a positive reinforcement cycle thereafter, where new laws enacted drew international praise which helped solidify Costa Rica's position as global leader in resource protection . To counter reducing forest area coverage in the 1980s, the Costa Rican government pioneered a scheme in 1997 known as PES, which rewarded private land owners for keeping forests intact on their lands in lieu of the services provided by these forests to the environment and the economy as a whole. The World Bank, which provided the loan initially from 2000 to 2006 to support the payments incentivizing afforestation, viewed the program as a success overall despite some of its shortcomings. It is estimated that the percentage of Costa Rican land covered by forests has gone up from around 20% in the 1980s to over 50% of the total area in 2013 - a growth of 250%. The program has also reduced the national carbon emissions by 11 million tons over a period of 6 years from 1999 to 2005. Indigenous communities and women in particular, have benefited due to this program. Buoyed by this success, the World Bank extended its support to the Costa Rican government's initiative by funding a new program titled "Mainstreaming Market-Based Instruments for Environmental Management". Over the years, many international agencies have pushed the national government to make the process of obtaining the payments easier so as to include more underdeveloped communities and cast a wider net for the program. The green sea turtle is a globally endangered species and one of the most important nesting grounds for it is in Tortuguero, Costa Rica - the word Totuguero is derived from old Spanish maps meaning "place of turtles". After a steady global decline in its population due to overhunting for its meat and eggs, the Tortuguero National Park was established in 1975 in an effort to protect and save the turtle's breeding zone. A highly cited study by Tröeng and Rankin, investigated in 2004, the effects that this protective measure has had on the nesting trend. Although the population of turtles shows a large inter-annual variation thus making the task of determining the exact number very difficult, on an average, the trend has been positive over a long time scale of almost 35 years. The study illustrated that the enactment of three laws by the Costa Rican government was vital in stabilizing and increasing the population of these green sea turtles. 3. The creation of the Tortuguero National Park in 1975 by the legislative assembly. The lasting impact created by such forward thinking political decisions exhibits the necessity of meaningful governmental intervention. Although they contribute only 0.15% to the world's greenhouse gas emissions, the governments of New Zealand and Costa Rica have independently expressed their intents to become carbon neutral in the next decade, with Costa Rica aiming to achieve an ambitious target of becoming carbon neutral by 2021. In doing so, it would become the world's first carbon neutral country, with the expectation of influencing policy decisions in other major countries. The proposal hopes to ignite the interest of private companies to engage in practices that reduce their emissions, for example, using more fuel efficient routes in transportation, relying more on digital documents than printed ones, adopting LED lighting in offices and using more efficient air conditioning systems. The government's approach to attain zero net emissions has yielded positive results overall, but has been described as insufficient and lacking by experts  because it neglects vehicular emissions which account for nearly 20% of the country's total emissions. The 2021 target has also been called "arbitrary" and "overambitious", since the efforts to reduce the country's reliance on imported oil  will take much longer to take effect. In 2006, a study by Sierra and Russman analyzed the additional conservation obtained through PES, over and above the baseline conservation rate. The study concluded that the PES program definitely affected land use decisions because land owners used the payments for other productive activities thus keeping the forest cover intact. However, they also concluded that this was not the most effective use of funds because the majority of these forests would have remained intact even without the payments. The study suggested that it would a better strategy to engage in the protection of more critical habitats instead. The jaguar is an endangered species and its habitat came under threat due to construction of the Reventazón Dam in the Reventazón valley. The Reventazón dam is the largest dam in Central America with an installed capacity of 305.5 MW. The two financiers of the project, the World Bank and the Inter-American Development Bank, financed it on the condition that the construction of the dam by the state-run Costa Rican Electricity Institute (ICE) would "restore and maintain connectivity within the Barbilla-Destierro Corridor" which is critical to the survival of the jaguar. 1) The constructors did not completely clear vegetation from the areas that would be flooded due to this project. As a result, the uncleared vegetation in the flooded areas began to stagnate, creating the perfect conditions for the growth of the Water Hyacinth (an invasive species). The Water Hyacinth acted as a source for a large amount of carbon dioxide and methane emitted into the atmosphere. 2) Reforestation around the reservoir lake to assist in the migration of the jaguars has not been completed making their movement more difficult. 3) Due to the removal of a lot of material to facilitate construction, the neighboring Lancaster wetlands (home to more than 250 species of birds and 80 species of mammals, reptiles and amphibians) have been left in a state more susceptible to landslides. What appears to be common in these criticisms is that the initiatives have moved things in the right direction overall, but the implementation hasn't been as good as promised. Deforestation and overpopulation are issues affecting all regions of the world. The consequent destruction of wildlife habitat has prompted the creation of conservation groups in other countries, some founded by local hunters who have witnessed declining wildlife populations first hand. Also, it was highly important for the conservation movement to solve problems of living conditions in the cities and the overpopulation of such places. The idea of incentive conservation is a modern one but its practice has clearly defended some of the sub Arctic wildernesses and the wildlife in those regions for thousands of years, especially by indigenous peoples such as the Evenk, Yakut, Sami, Inuit and Cree. The fur trade and hunting by these peoples have preserved these regions for thousands of years. Ironically, the pressure now upon them comes from non-renewable resources such as oil, sometimes to make synthetic clothing which is advocated as a humane substitute for fur. (See Raccoon dog for case study of the conservation of an animal through fur trade.) Similarly, in the case of the beaver, hunting and fur trade were thought to bring about the animal's demise, when in fact they were an integral part of its conservation. For many years children's books stated and still do, that the decline in the beaver population was due to the fur trade. In reality however, the decline in beaver numbers was because of habitat destruction and deforestation, as well as its continued persecution as a pest (it causes flooding). In Cree lands however, where the population valued the animal for meat and fur, it continued to thrive. The Inuit defend their relationship with the seal in response to outside critics. The Izoceño-Guaraní of Santa Cruz Department, Bolivia is a tribe of hunters who were influential in establishing the Capitania del Alto y Bajo Isoso (CABI). CABI promotes economic growth and survival of the Izoceno people while discouraging the rapid destruction of habitat within Bolivia's Gran Chaco. They are responsible for the creation of the 34,000 square kilometre Kaa-Iya del Gran Chaco National Park and Integrated Management Area (KINP). The KINP protects the most biodiverse portion of the Gran Chaco, an ecoregion shared with Argentina, Paraguay and Brazil. In 1996, the Wildlife Conservation Society joined forces with CABI to institute wildlife and hunting monitoring programs in 23 Izoceño communities. The partnership combines traditional beliefs and local knowledge with the political and administrative tools needed to effectively manage habitats. The programs rely solely on voluntary participation by local hunters who perform self-monitoring techniques and keep records of their hunts. The information obtained by the hunters participating in the program has provided CABI with important data required to make educated decisions about the use of the land. Hunters have been willing participants in this program because of pride in their traditional activities, encouragement by their communities and expectations of benefits to the area. In order to discourage illegal South African hunting parties and ensure future local use and sustainability, indigenous hunters in Botswana began lobbying for and implementing conservation practices in the 1960s. The Fauna Preservation Society of Ngamiland (FPS) was formed in 1962 by the husband and wife team: Robert Kay and June Kay, environmentalists working in conjunction with the Batawana tribes to preserve wildlife habitat. The FPS promotes habitat conservation and provides local education for preservation of wildlife. Conservation initiatives were met with strong opposition from the Botswana government because of the monies tied to big-game hunting. In 1963, BaTawanga Chiefs and tribal hunter/adventurers in conjunction with the FPS founded Moremi National Park and Wildlife Refuge, the first area to be set aside by tribal people rather than governmental forces. Moremi National Park is home to a variety of wildlife, including lions, giraffes, elephants, buffalo, zebra, cheetahs and antelope, and covers an area of 3,000 square kilometers. Most of the groups involved with establishing this protected land were involved with hunting and were motivated by their personal observations of declining wildlife and habitat. ^ Gifford, John C. (1945). Living by the Land. Coral Gables, Florida: Glade House. p. 8. ASIN B0006EUXGQ. ^ John Evelyn, Sylva, Or A Discourse of Forest Trees ... with an Essay on the Life and Works of the Author by John Nisbet, Fourth Edition (1706), reprinted London: Doubleday & Co., 1908, V1, p. lxv; online edn, March 2007 , accessed 29 Dec 2012. This source (John Nisbet) states: "There can be no doubt that John Evelyn, both during his own lifetime and throughout the two centuries which have elapsed since his death in 1706, has exerted more individual influence, through his charming Sylva, ... than can be ascribed to any other individual." Nisbet adds that "Evelyn was by no means the first [author] who wrote on [forestry]. That honour belongs to Master Fitzherbert, whose Boke of Husbandrie was published in 1534" (V1, p. lxvi). ^ "History of forests in India". ^ Barton, Greg (2002). Empire Forestry and the Origins of Environmentalism. Cambridge University Press. p. 48. ISBN 9781139434607. ^ Oliver, J.W. (1901). "Forestry in India". The Indian Forester. v.27 (Original from Harvard University, Digitized Apr 4, 2008 ed.). Allahabad: R. P. Sharma, Business Manager, Indian Forester. pp. 617–623. ^ Weil, Benjamin (1 April 2006). "Conservation, Exploitation, and Cultural Change in the Indian Forest Service, 1875-1927". Environmental History. 11 (2): 319–343. doi:10.1093/envhis/11.2.319. ^ Burley, Jeffery, et al. 2009. "A History of Forestry at Oxford", British Scholar, Vol. 1, No. 2., pp.236-261. Accessed: May 6, 2012. ^ Rawat, Ajay Singh (1993). Indian Forestry: A Perspective. Indus Publishing. pp. 85–88. ISBN 9788185182780. ^ "U.S. Statutes at Large, Vol. 26, Chap. 1263, pp. 650-52. "An act to set apart certain tracts of land in the State of California as forest reservations." [H.R. 12187]". Evolution of the Conservation Movement, 1850-1920. Library of Congress. ^ Watts, Jonathan (2010-10-25). "Costa Rica recognised for biodiversity protection". the Guardian. Retrieved 2018-06-09. ^ a b c d e f Evans, Sterling (2010-06-28). The Green Republic: A Conservation History of Costa Rica. University of Texas Press. ISBN 9780292789289. ^ "Costa Rica tourism sets new record with 2.6 million visitors in 2015". The Tico Times Costa Rica. Retrieved 2018-06-08. ^ "Human Development Reports". hdr.undp.org. Retrieved 2018-06-08. ^ "Costa Rica runs entirely on renewable energy for 300 days this year". The Independent. Retrieved 2018-06-07. ^ Flagg, Julia A. (2018-01-24). "Carbon Neutral by 2021: The Past and Present of Costa Rica's Unusual Political Tradition". Sustainability. 10 (2): 296. doi:10.3390/su10020296. ^ Mahoney, James (2009). Colonialism and Postcolonial Development. Cambridge: Cambridge University Press. doi:10.1017/cbo9780511750328. ISBN 9780511750328. ^ "Payments for ecosystem services: Costa Rica's recipe". International Institute for Environment and Development. 2013-11-29. Retrieved 2018-06-08. ^ "Costa Rica Improves the Efficiency of its Payment for Environmental Services Program". World Bank. Retrieved 2018-06-08. ^ "Projects : Mainstreaming Market-Based Instruments for Environmental Management Project | The World Bank". projects.worldbank.org. Retrieved 2018-06-08. ^ a b c Troëng, Sebastian; Rankin, Eddy (2005-01-01). "Long-term conservation efforts contribute to positive green turtle Chelonia mydas nesting trend at Tortuguero, Costa Rica". Biological Conservation. 121 (1): 111–116. doi:10.1016/j.biocon.2004.04.014. ISSN 0006-3207. ^ "Costa Rica and New Zealand on Path to Carbon Neutrality | Worldwatch Institute". worldwatch.org. Retrieved 2018-06-08. ^ a b Villegas, Charito (2017-11-14). "Costa Rica Promotes the Carbon Neutral Program in 2021 | The Costa Rica News". The Costa Rica News. Retrieved 2018-06-08. ^ STAFF, TCRN (2014-07-21). "Costa Rica Carbon Neutral 2021: Reality or Unrealistic?". The Costa Rica News. Retrieved 2018-06-08. ^ a b Sierra, Rodrigo; Russman, Eric (2006-08-05). "On the efficiency of environmental service payments: A forest conservation assessment in the Osa Peninsula, Costa Rica". Ecological Economics. 59 (1): 131–141. doi:10.1016/j.ecolecon.2005.10.010. ISSN 0921-8009. ^ a b "The Jaguar Project :: Impact of the Reventazon Hydroelectric Project". thejaguarproject.com. Retrieved 2018-06-09. ^ "Costa Rica juggles jaguars and dam construction with matching grant". The Tico Times Costa Rica. Retrieved 2018-06-09. ^ "Costa Rica's president inaugurates Central America's largest hydropower plant - China.org.cn". china.org.cn. Retrieved 2018-06-09. ^ "Inuit Ask Europeans to Support Its Seal Hunt and Way of Life" (PDF). 6 March 2006. Archived from the original (PDF) on 28 June 2007. Retrieved 12 July 2007. Bolaane, Maitseo. "Chiefs, Hunters & Adventurers: The Foundation of the Okavango/Moremi National Park, Botswana". Journal of Historical Geography. 31.2 (Apr. 2005): 241-259. Noss, Andrew and Imke Oetting. "Hunter Self-Monitoring by the Izoceño -Guarani in the Bolivian Chaco". Biodiversity & Conservation. 14.11 (2005): 2679-2693. Wakild, Emily. An Unexpected Environment: National Park Creation, Resource Custodianship, and the Mexican Revolution. University of Arizona Press (2011). Arnone Sipari, Lorenzo, Scritti scelti di Erminio Sipari sul Parco Nazionale d'Abruzzo (1922-1933) (2011), 360pp. Bonhomme, Brian. Forests, Peasants and Revolutionaries: Forest Conservation & Organization in Soviet Russia, 1917-1929 (2005) 252pp. Cioc, Mark. The Rhine: An Eco-Biography, 1815-2000 (2002). Simmons, I.G. An Environmental History of Great Britain: From 10,000 Years Ago to the Present (2001). Weiner, Douglas R. Models of Nature: Ecology, Conservation and Cultural Revolution in Soviet Russia (2000) 324pp; covers 1917 to 1939. Flippen, J. Brooks. Nixon and the Environment (2000). Hays, Samuel P. Conservation and the Gospel of Efficiency (1959), on Progressive Era. Pinchot, Gifford (1922). "Conservation Policy" . Encyclopædia Britannica (12th ed.). Scheffer, Victor B. The Shaping of Environmentalism in America (1991). Taylor, Dorceta E. The Rise of the American Conservation Movement: Power, Privilege, and Environmental Protection (Duke U.P. 2016) x, 486 pp. McNeill, John R. "Observations on the Nature and Culture of Environmental History," History and Theory, 42 (2003), pp. 5–43.